today I thought we’d take a look at what styles of dresses were popular in December 1831 in both England and France. It seems that ugly huge sleeves were still popular, which is a shame cos they really cheapen the dresses in my opinion. But I love the colors: the cheerful yellow, the sumptuous green, the rich red… aren’t they gorgeous? What do you think of these outfits? A dress composed of gold-coloured gros de Tours; the corsage cut low; it is plain behind, but disposed across the front in a Grecian drapery. Single bouffant sleeve, of the material of the dress, over which is a long one of plain white blond; it is of the demi-imbecille shape; pelerine-fichu of blond lace; the bouquets highly raised, and very rich, are placed horizontally at some distance from each other, and intersected by white satin rouleaux disposed in sharp points. It is trimmed round the top with blond lace in a very novel style, and so as to display the whole of the throat. The ends are pointed: they cross upon the bosom, and fasten on the point at the back of the waist by a rosette similar to the neck-knot, which is of gauze ribbon to correspond with the dress. The head-dress is a velvet beret; the colour, a rich shade of violet. The brim, very short at the ears, but unusually deep, is ornamented on the inside with coques of white gauze ribbon. A bouquet of five white ostrich feathers adorns the crown; they droop in different directions over the brim. Ear-rings and bracelets, dead gold. A gros de Naples dress; the colour, the darkest shade of aventurine; the corsage, made up to the throat, is ornamented with a lappel disposed en amazone; the sleeves are en gigot, but disposed at the lower part in three folds, laid one above another. Three rouleaux of sable fur adorn the border: they are placed at some distance from each other; the highest does not reach above the knee. A rose de parnasse satin bonnet, over a tulle morning cap. The inside of the brim is trimmed with blond lace, intermixed with ends of cut ribbon to correspond with the bonnet, and a rosette of cut ribbon is placed near the top of the crown. The mantle is composed of reps Africain: the ground is terre d’Egypte colour, printed in rosaces of bright green and rose colour; it is wadded and lined with green gros de Naples, rather less ample than they were last year, with a very large square pelerine, and a moderate-sized collar; the latter in the style of a gentleman’s coat. The coil lerette is a very full ruche of tulle, which stands up round the throat. An open dress, composed of white watered gros de Naples, over a pale rose-coloured slip. Corsage, of a novel form: the collar high, and sitting close to the neck behind, forms a lappel on the upper part of the bust; the corsage sits close to the shape, and is partially covered by a very large pelerine, rounded behind, but forming a coeur in front. The back of the collar, the whole of the pelerine, and the tour of the dress, are cut in dents de Liontine. The sleeves are a l’ Amadis. The skirt is very ample; it falls in folds behind; is very open in front, and a little shorter than the under dress. The headdress is a blond lace cap, made very short at the ears; the trimming, which turns back, is a triple row of blond lace: it is sustained by a band of blue figured gauze ribbon, which terminates over each temple by a small knot formed of ends of ribbon. A wreath of ribbon surmounts the trimming on the summit of the head. The brides hang loose. The scarf is of gold-coloured gaze Algerienne, with very rich ends. A dress composed of emerald-green gros d’Orient. The corsage, cut very low round the bust, is finished by a lappel of the same material, cut round the border in a wreath of leaves, which are corded with satin to correspond. The lappel is square on the back and front of the bust, but becomes much deeper, and almost pointed, in the centre of each shoulder, where it forms a jockey. Short sleeves of the material of the dress, over which are long ones, à la Venitienne, of blond lace. The head-dress is a chapeau a la Plater, of green velvet: the crown is in the form of a Polish lancer’s cap; the brim is of moderate size, short and close at the ears, but wide over the forehead, and of a round shape: it is trimmed on the inside with a wreath en coquille, of blond lace. A bouquet of white and lilac ostrich feathers, with nauds and brides of canary gauze ribbon, adorn the crown. The jewellery worn with this dress should be of gold and emeralds. A white crape dress over white satin. The corsage, cut very low, and dressed before in the Grecian style, is trimmed en mantilla, with blond lace round the back and shoulders. 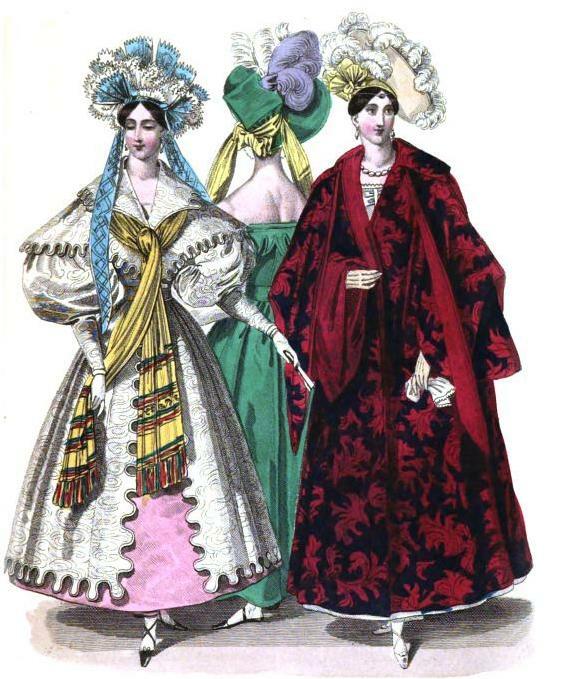 The sleeves are of the double beret form; the upper part excessively full, the lower much smaller. Manteau a la Polonaise, composed of a new and very rich material, a black gros des Indes ground, figured in crimson satin, very highly raised: it is made very ample, lined with crimson gros de Naples; has a large square collar, and an excessively large pelerine, pointed before, and in the centre of the back, and has large Turkish sleeves, sustained at the top by whalebone, so that they do not fall over those of the dress. 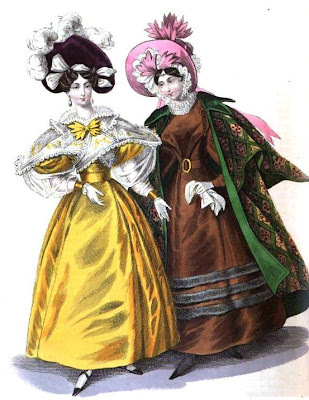 The head-dress is a very pale amber crape beret, trimmed under the brim, on the left side, by a bouquet of short white ostrich feathers, which droop to the right: they are attached by a knot of canary gauze ribbon. A larger bouquet adorns the crown: the feathers fall in contrary directions over the brim. Ear-rings, &c. pearl.